Denim fabric is a roving cotton fabric, which has better wear-proof and anti tearing performance than common fabric because of roving yarn and closely processed. In the beginning, the denim fabric is widely used in the industry with wide range of activity and poor production environment, such as sailing, pasture husbandry and mine. With the time going, the old denim fabric couldn’t catch the demand of some new industry. Multi-function denim fabric is emerged to meet the requirement of modern industries in time. 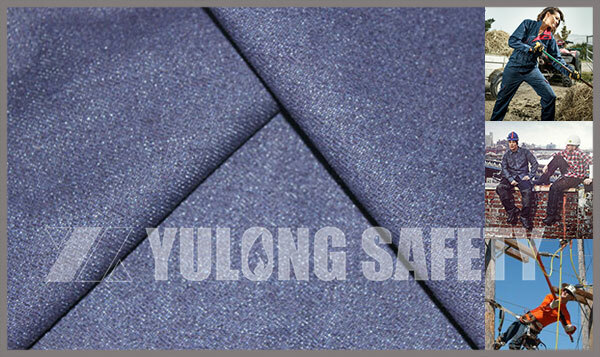 We are honored to introduce the common flame retardant denim fabric. It could be blue or dark in most people’s memory and how to distinguish it clearly is hardly to know. After reading the article below, I think you can have a more and further comprehension about the flame retardant denim fabric. 2.Keep clear fabric grain even in light gram weight series, ensure less wrinkle and keep the clothing flat at any time. 3.Keep excellent FR feature even washed and stable colour fastness. Prevent dyeing with each other because of much sweat after heavy activity. Besides the good features above, Our ring spun flame retardant denim fabric have nice sense and excellent draping, The slub effect is more nature and beauty after grinded and washed. The most impotent is that the physical property will be more stable after FR processed, the features like wear proof, anti-tearing, breaking force are more better than common rotor fabric which devoted to a long time use. The ring spun flame retardant denim fabric supplied by Xinxiang Yulong Texile Co.,LTD is popular with new and old clients, Welcome ordering from us.